1. Polyphyletic: It means that all phyla have separate origin. But still scientist that the number of independent origins is probably small. 2. Diphyletic: Some zoologists believe that the animal kingdom is Diphyletic. Therefore, the Poriferan derived separately from all other phyla. There is a similarity betwen poriferan choanocytes and choanoflagellates. 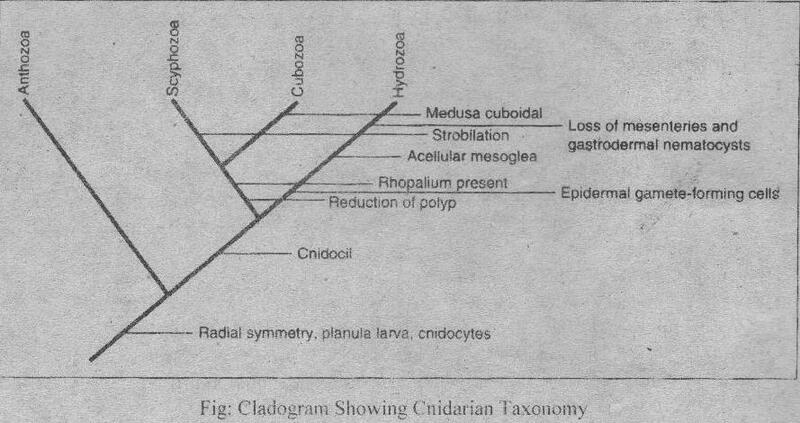 This similarity suggests that protists have evolutionan ties with these groups. 3. Monophyletic: Many zoologists believe that the sponges have a common ancestry with other animals. The amoeboid and ilasliated cells in sponges and higher animals support this view. But the Porilera are evolutionary “dead ends“. They gave rise to no other animal phyla. 1. Radial ancestor: One interpretation is that the ancestral animal was derived from a radially ancestor. This ancestor itself is derived from a colonial flagellate. Therefore, radiate phyla (Cnidaria and (ctenophora) are closely related to that ancestral group. 2. Bilateral ancestor: Other zoologists believe that bilateral symmetry is the body form. The bilateral ancestor gave rise to both the radiate phyla and bilateral phyla. 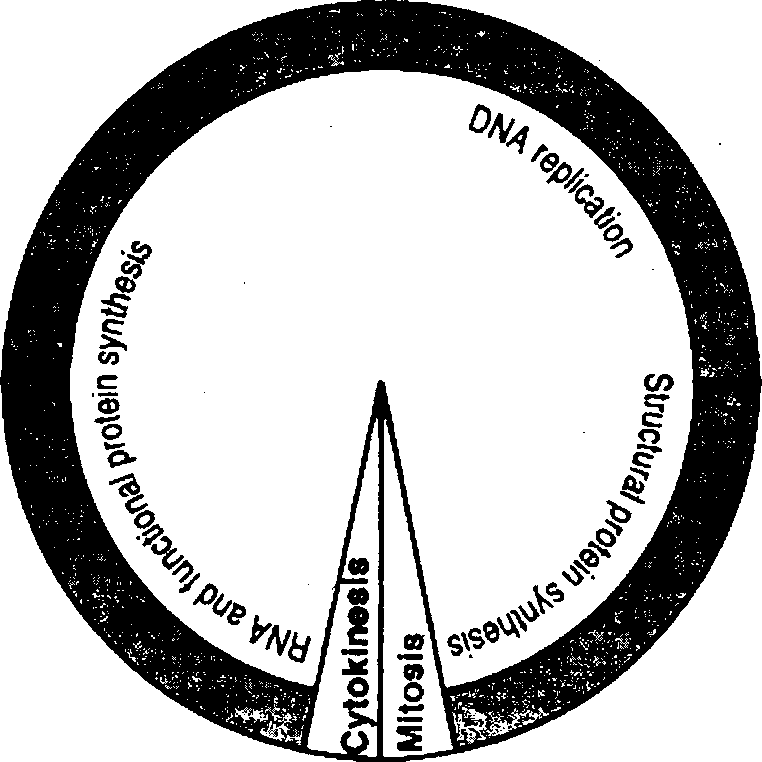 Therefore, the radiate phyla are removed from the base of the evolutionary tree. The classical interpretation is that primitive Hydrozoa were the ancestral radial animals. The medusoid body form is the primitive body form. It suggests that the medusa is the adult body form in the Hydrozoa. Therefore, it is the only body form in some trachyline hydrozoans. The polyp evolved secondarily as a larval stage. Then septa appeared. It divided the gastrovascular cavity. Therefore, the gonads becomes endormal in origin. Thus origin of three other classes took place. 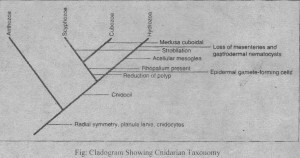 There is evolutionary reduction of the polyp stage in class Syphozoa and Cubozoa. But there is a loss of medusa stage in Anthozoa. Budding take places in the polyp of Scyphozoa. The shape of medusa of Cubozoa is cuboidal. But still there are differences in adult body forms and embryological development. Thercfore, it is difficult to derive the Ctenophora from any group of cnidarians. Thus, there are distant relationships between Cnidaria and Ctenophore. Pellicle A regular arrangement of microtubules is called the pellicle. Gemmule Gemmule is a resistant capsule containing masses ot amoeboid cells. Biradial symmetry In this case a single plane, passing through a central axis. divides the animal into mirror images. Mesoglea A jelly like layer is present between the epidermis and gastrodermis. It is called mesoglea. ‘Alternation of generation The phenomenon in which asexually reproducing medusa alternates reproducing medusa is called alternation of generation. Polyp The tube like zooid is called polyp. Medusa The umbrella like zooid is called medusa. Colloblasts The ctenophores possess adhesive structures called colloblasts.